Anthony Vereker (“Tony”) Mr Herbert Weller, jun. “A Safety Match,” by Ian Hay, was staged by the Temple Dramatic Society on Thursday, Friday and Saturday of last week in the Village Hall, St. Mary Cray. The story is unfolded by a cast of 27, most of whome have some salient part in its action. Sir John Carr (“Juggernaut” to his business rivals) marries the daughter of his old friend, the Rev. Brian Vereker, Rector of Snayling. But they do not find married happiness because of sir John’s love of system, which stifles any affection there might be between them. In his home, which adjoins his colliery at Belton, she grows discontented to the pitch of leaving him for a holiday in Algiers. A strike, due to the discharge of two agitators from the colliery, leads to bad blood among the men, and culminates in a riot at Belton House. While this is growing ugly news comes from the village that there has been a mishap in the pit. This proves to be the “box“ which makes the “safety match” between Sir John and Daphney burst into phlame, for he finds that hse is ready to stand by him, and that his ruthlessness cannot bring him real happiness. The scenes take the audience into the homely life of a clergyman“s faimly who can hardly make ends meet; behind the scenes of industry; and into the innermost thoughts of the working man who at heart is deeply religious. All is coloured with the spirit of good nature that is observed in Ian Hay“s comedies, and although the drama is far from full-blooded, it is natural enough to get its effect. With such a great field to get into perspective, Mr. G. Waller, who produced, cast and handled his actors well. The first group were the rectory people, headed by the Rector—a quiet picture of resignation and dry humour in the hands of Mr. Waller himself. His homeliness was reflected in Daphne, the daughter, who had taken over home management when his wife died. Mrs. F. L. Duck had the first unassuming damsel and then the unfulfilled woman to present, and played with emotion as both of them. Then there was Veronica, the highly romantic, but none the less lovable younger sister. Miss Beckie Collier proided the lion’s share of hte comedy in this role. Aloysius (who was sent to Cambridge when Daphne married and naturaly go into “a jam”), Stephen (whose business it was to act as a foil to Veronica) and Anthony (whose chief amusement was imagining himself into the persons of Handel—or a cuttlefish), were extremely believable as the three boys. They were Messrs. Fred Murrells, Will Algar and Herbert Weller, jun., respectively. Then, of course, there was “Mr. Dawkes,” who was most well-behaved. Sir John seemed a trifle on the youthful side, but his half-Satanic appearance and iron manner were well interpreted by Mr. W. Eric Webb. Others in his circle were Lord Kirkley, one of his directors (Mr. Leo E. Tompkins); Mr. Montague (an officious being whose short appearance was quite amusing) played by Mr. Ian Mackenzie, and Juggernaut’s secretary, Jim Carthew. As Jim, Mr. F. Leslie Duck gave his audience several bits of well-presented philosophy, and altogther was a true specimen of the “woolly lamb” genus. Lady Strathrae (Mrs. L. E. Tompkins) took an interest in the two dear young things becaue of a real affection for them, and her part was played with due regard for the sentimentality that is strongest in the worldly-wise. The young secretary was in love with Nina Tallentyre, and this was acted by Miss Joy Duck with sufficient restraint to suggest that Nina was at heart a lily, though she tried to appear a sophisticated orchid. By contrast, the colliers and their wives gave a good mass impression of unrest. Jacob Entwistle was the old man who found the solution to the problem by disclosing a tunnel that led to the entrapped miners, and Mr. C. Murrells and carried his great moment successfully. His son, Amos, was played by Mr. Wilfred Sampson, whose part with Tom Winch (Mr. F. J. Duck was a really funny agitator) and John Killick (whom Mr. G. Waller made a study in fiery conviction) in the parley scheme was done well. Mr. F. Murrells also handled the part of Mr. Walker—presumably a checkweightman or some such officer—who acted as chorus to tell what had happened off-stage. Miss Dorothy Wood was a striking picture of poverty as Mrs. Brash, wife of Albert Brash (Mr. Richard Sparkes) whose only real function was to be knocked down by the Juggernaut. The three men who were trapped with Jim Carthew in the mine were Bill Denton (F. Murrells), Bob Atkinson (C. Murrells) and Albert Hopper (Will Algar). The first two sustained the battle between religion (the religion of the “saved,” which prevailed on the men to sing “Hold the fort” in the end) and hopelessness in a dramatic way, but not always with the sympathy of the audience, which was unfortunate. As Hopper, Mr. Algar groaned convincingly. Others who took part were Miss Cissie Betts (who doubled as a parlourmade and as the wife of younf Entwistle efficiently), Mr. Will Davis (Graves the butler—almost too perfect) and Mr. Herbert Weller. Mr. Weller was r. Burnage of Fleet-street (by which token he was a pressman) and flourished a reportorial notebook with all the abandon that tradition demands. 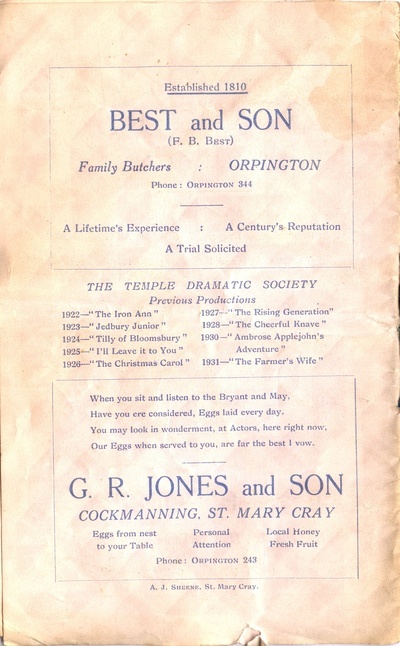 Mr. Cyril Grimes was unable to appear in the parts of Aloysius and Bill Denton, and was replaced by Mr. F. Murrells, who thus took three roles. Mr. Murrells’s place as Tom Winch was taken by Mr. F. Duck. Mr. Grimes was able to appear on Saturday. Scenery and lighting were quite safe in the hands of Mr. C. Murrells, whose noises off and crowt murmers were well got up. Mr. W. C. Webb lent the electrical gramophone, which filled the short waits with light music, and Messrs. Stangers lent furniture for certain scenes. Efficiency was the keynote of the production, which was well worth sitting through and free from those irritating blemishes that so often mar the work of amateur companies. 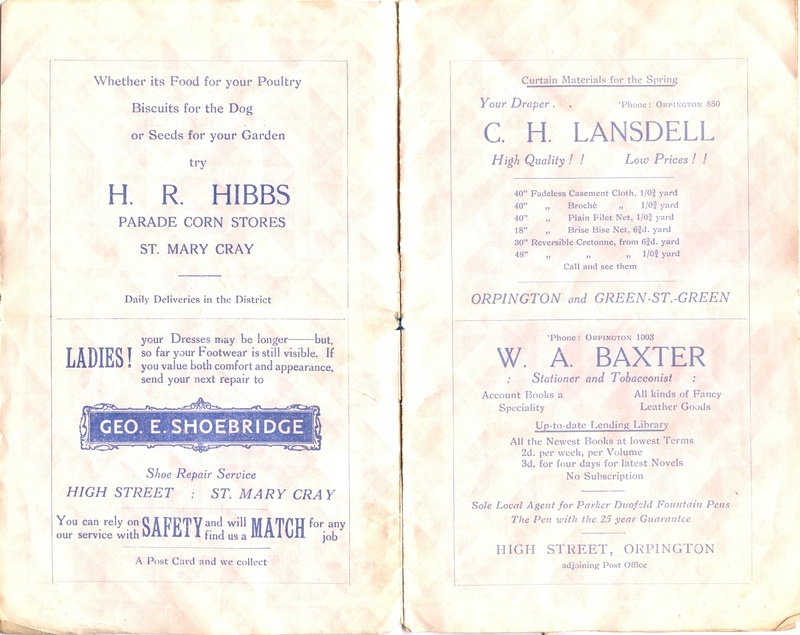 The programme sellers were Mrs. A. Cryer, Miss I. Spearing, Miss C. Betts and Miss E. Hook; and the stewards: Mr. R. Murrells, Mr. T. Crowhurst, Mr. A. Cryer, Mr. F. Duck, Mr. F. Murrells, Mr. W. Collier, and Mr. G. Blackstone. This, the tenth annual production of the Temple Dramatic Society, may not rank as its best; certainly it i not the least successful. Once again one is struck by the pluck of the organisers who, unlike so many dramateurs, did not shirk scenic and other difficulties. In this play of Ian Hay’s there are four acts, six scenes involving four changes of scenery. It says much for the work of those behund the scenes that there were no unduly long delays between scenes. How much this was due to Mr. C. Murrells, who in addition to making the scenery was stage manager, I do not know but his work in this and former productions merit special recognition. The toast, ladies and gentlemen, is Mr. Murrells. There is plenty of drama and comedy in this story of the coal mines and it would have gathered weight if taken at a faster pace. As it was played the play seemed to proceed from one situation to another in a series of jerks and insaying this I am not unmindful of the difficulties. 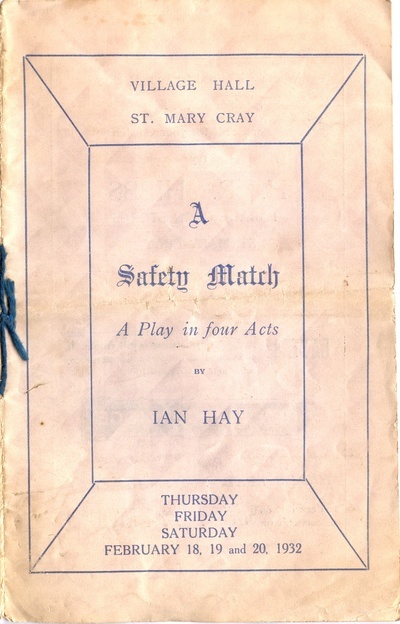 Ian Hay’s “Safety Match” is not a “safe bet” for amateurs, but the Temple Dramatic Society succeeded in “putting it over” with conviction at St. Mary Cray Village Hall on Thursday last week. The story deals with the very business-like marriage—the “safety match”—of a poor clergyman’s daughter to a rich business man, and the almost disastrous conflict of their temperaments when the young wife arrives in the new, strange atmosphere of wealth and position. The play is one of clever moments rather than sustained brilliance, and for that reason the same may be said of the actors’ performances. 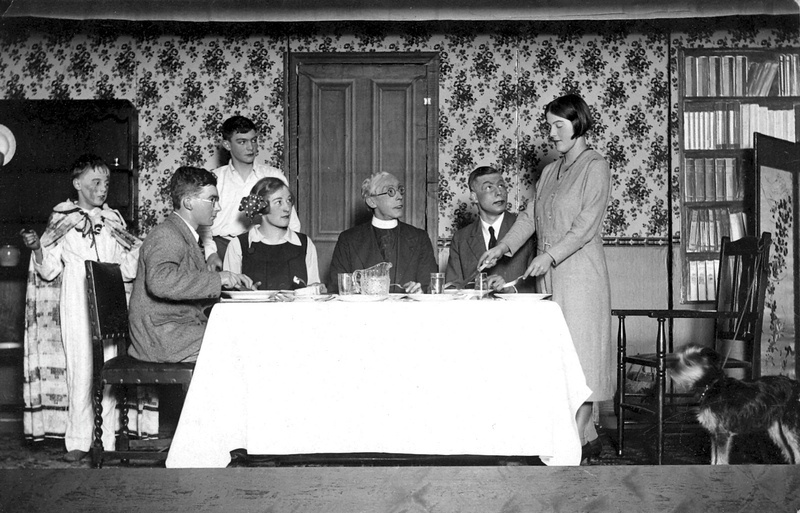 The first act, with its intimate picture of life in a country rectory where the household budget is a pressing problem, had some good homely humour and a promise of amusing situations that was not fulfilled. A gripping schene was that in which six men, including a business magnate’s secretary, a miner of revolutionary tendencies, a Salvation Army convert, and a young lad loath to die, are imprisoned in a mine. This situation, with its darkness and its fear of death is by no means new, but it is impressive if well done, as it was in this case. The most consistent acting was that of Miss Beckie Collier, who put exactly the right amount of sprightliness combined with intelligence into the part of “Nicky Vereker,” an impudent hoyden. Her acting never flagged but it was neither forced nor overdone. In unsympathetic hands the character of “Nicky” would soon have tired the audience, but actually she set held their interest and even gained their affection. As the male partner in the “safety match,” Mr. W. Eric Webb scored a merited success. He entered conscientiously into the spirit of “ ‘Juggernaut’ Carr,” the coal magnate, a strong character masking big-hearted kindness with a brusque exterior in the English manner. Mr. Webb obviously understood his part and he succeeded in onveying his understanding across the footlights. His only handicap was that he had not the burly figure the part demanded. This occasionally made his dramatic attitudes mere posturing. After a first act, in which she was delightful as the naive young “mother” of the rectory family, Mrs. F. L. Duck (“Daphne Vereker”) did not always rise to the heights demanded by later episodes. Nevertheless she was a very charming and adequate heroine. One must admire the company’s courage in choosing a play in which it is necessary to introduce a dog on to the stage, for animals have a knack of doing the unexpected, even though stage fright is not a common fault among them. But “Mr. 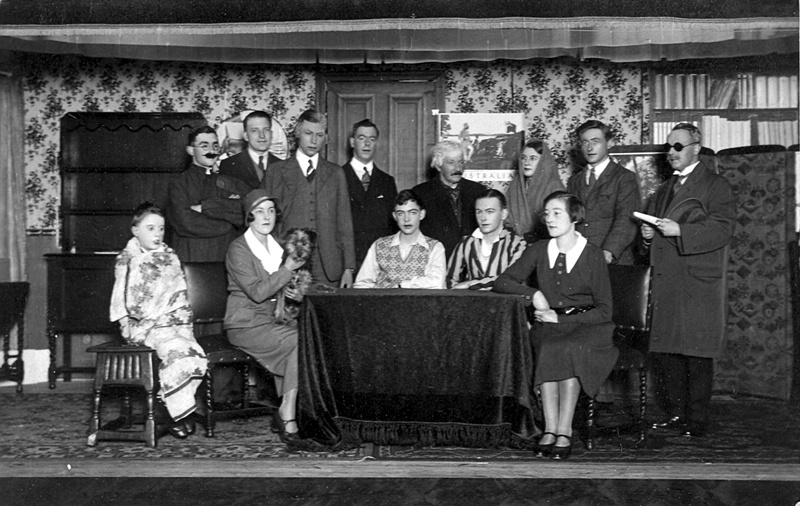 Dawkes” proved himself a very amiable gentleman with a natural flair for amateur dramatics. 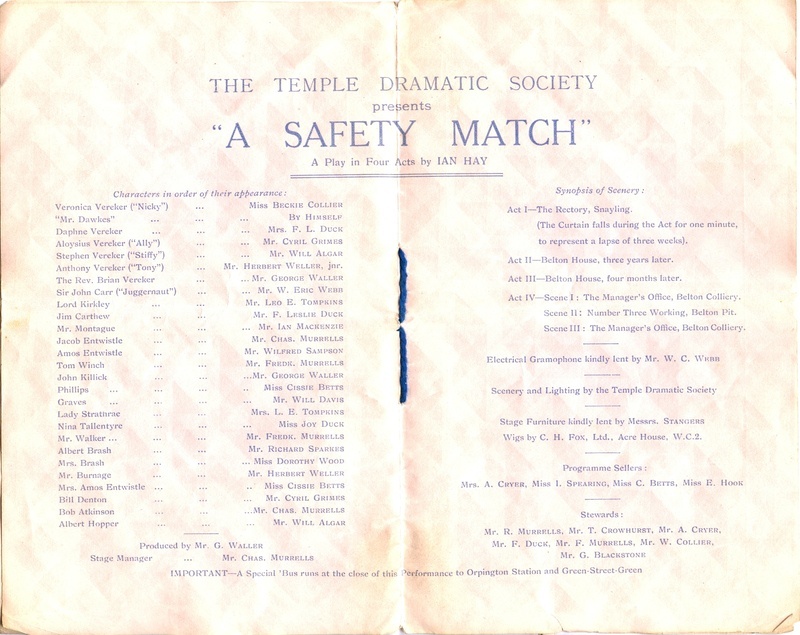 The play was produced by Mr. G. Waller, and Mr. Charles Murrells was stage manager. 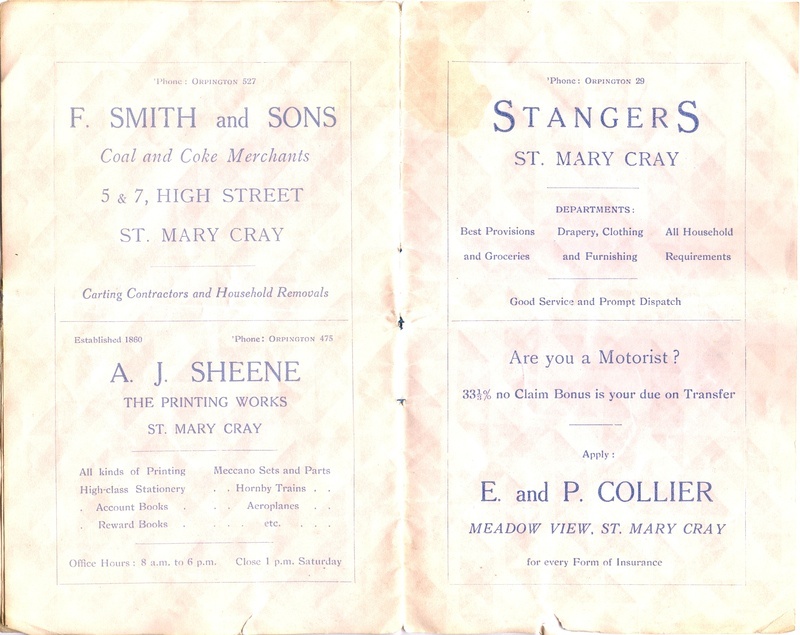 Mrs. A. Cryer, Miss I. Spearing, Miss C. Betts and Miss E. Hook were programme sellers and Mr. Murrells, Mr. T. Crowhurst, Mr. A. Cryer, Mr. F. Duck, Mr. F. Murrells, Mr. W. Collier and Mr. G. Blackstone were stewards. Mr. Cyril Grimes was able to take the roles of “Aloysius Vereker” and “Bill Denton” at the performances on Friday and Saturday.